As the world’s largest continent, it’s no surprise that Asia is teeming with activities, attractions, and some of the planet’s most legendary sites. It’s made up of 48 countries and surrounded by oceans on three sides, the Arctic, Pacific, and Indian. It is also part of the Middle East, where three continents converge: Africa, Asia, and Europe. The Dead Sea, the lowest point on Earth, and Mount Everest, the highest mountain above sea level in the world, are also located in Asia. It is home to prominent attractions and destinations such as the Great Wall of China, the Himalayan Mountains, the 4000 Islands, the Banaue Rice Terraces, and the Taj Mahal. Here are 25 things to do in Asia that can’t be missed. 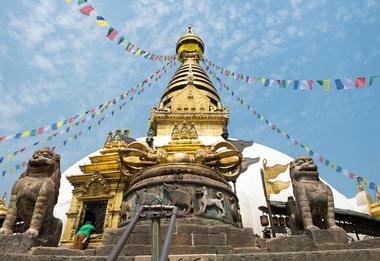 The Swayambhunath Monkey Temple is a three-in-one attraction situated atop a grand hill west of Kathmandu. Exercise, spirituality, and wildlife viewing each play a role in the experience. A fixture in Nepal since the 5th century AD, visitors will climb their way up 365 steep steps to make it to the top, where they’ll be rewarded with incredible panoramic views of the Kathmandu Valley. This sacred pilgrimage site features a stunning domed stupa and a collection of shrines and temples, each of the latter are exquisitely decorated with gold and colorful prayer flags. The complex is also home to a large number of monkeys, considered holy by both Hindus and Buddhists. Angkor Night Market is a charming food and shopping village near Sivatha Street. The first of its kind in Cambodia, and still the most visited, it provides visitors with an array of attractions and shopping opportunities. It features an eclectic mix of stalls selling everything from handicrafts and souvenirs to elegant silks, rice-art paintings, and leather carvings. The market is also home to several eateries and lounges, including the CoCo House, the popular Brick House Bar, and the Island Bar, where visitors can enjoy live music. A 3D movie about the scourge of land mines and the Dr. Fish massage are just a few additional highlights of this market. In Chinese history, Beijing was an ancient capital and one of the most strategic cities in the country’s northern region, and the construction and expansion of the Great Wall of China was ordered by various rulers over the centuries. 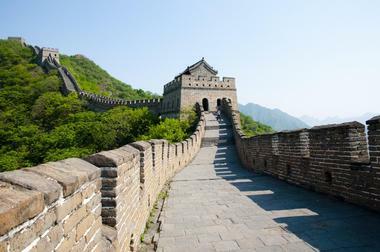 Beijing contains 327 miles of its 5,500-mile length and has long been considered the best place to admire the Great Wall as its most prominent sections are located within the city’s suburban areas. 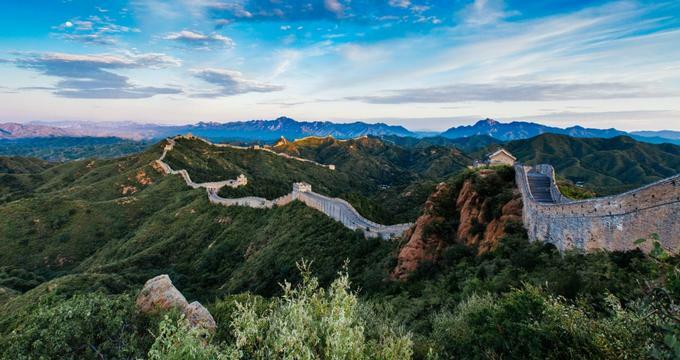 This includes the well-maintained Mutianyu and Badaling, the renovated Simatai, Juyonguan, and Jinshanling, and the more rugged Gubeikou and Jiankou. Located in the western region of Shanghai, the Jade Buddha Temple was created to house two jade Buddha statues that a monk named Huigen brought back from Burma. 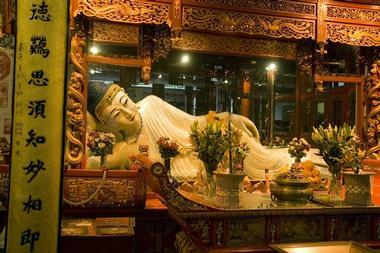 These beloved statues are both rare cultural relics and beautiful pieces of art, each carved from whole white jade. The Recumbent Buddha is shaped in the “lucky repose” position spanning 3 feet in length and boasting a calm facial expression to represent the tranquility and peacefulness of the Buddha before he left this world. At over 6 feet high, the Sitting Buddha is encrusted with emerald and agate to reflect the Buddha at the pinnacle of his enlightenment and meditation. 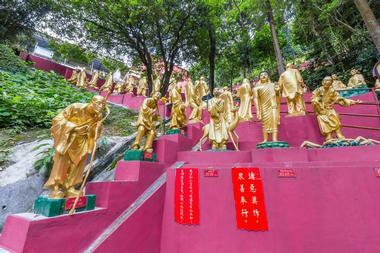 Built in 1957 and situated in Sha Tin, the Ten Thousand Buddhas Monastery is Hong Kong’s most iconic temple. Visitors will need to climb over 430 steep steps and a concrete pathway in order to reach the off-the-beaten-path complex. Along the way they’ll pass by an array of life-sized gold-painted Buddha statues. Once at the top, they can explore the five temples, four pavilions, and the pagoda, which each have varying numbers of golden Buddhas and other statues on display. This is also an excellent destination to enjoy panoramic views of Sha Tin and the New Territories as well as the chance to see a wild monkey or two. 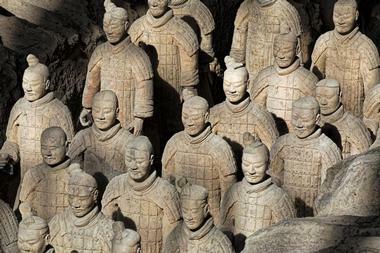 The Terracotta Army is one of the 20th century’s most historic and significant archeological excavations. Located in Xian, China, this 6.3-acre UNESCO World Heritage Site features 8,000 life-sized terracotta warrior and horse sculptures. They are showcased in the same formations as the mega imperial guard troops of Emperor Qin Shi Huang, who was the first emperor of the first united dynasty of imperial China. Originally this site was to be a funerary for Emperor Qin Shi Huang, but today it serves as a museum where visitors can learn about the life stories of this iconic emperor and the once dominant Qin Empire. 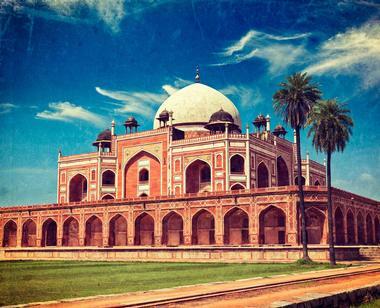 Built in 1565 AD, Humayun’s Tomb is the first consequential example of Mughal architecture in India. This impressive garden tomb was built by Humayun’s senior widow, Bega Begam, 9 years after he passed away. When visitors enter the tomb, they will find beautiful garden squares also known as chaharbagh connected by pathways. The tomb’s focal point is most assuredly the stunning, opulent mausoleum adorned with a double dome. There are also numerous gravesites of other Mughal rulers within the tomb, and Emperor Bahadur Shah II was the last person to be laid to rest here in 1957 AD. The Lotus Temple, also known as mashriq al-adhkar, is a house of worship created by award-winning Iranian architect Fariboz Sahba in 1986. 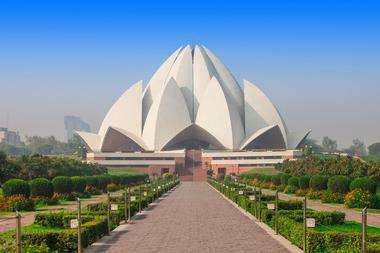 Like all Baha’í mashriqs, its design features nine sides, as the Baha’í believe in the mystical properties of the number nine, which subsequently creates the lotus look of the temple. It’s situated on 26 elevated acres surrounded by nine pools and encircled with red sandstone walkways. Its white marble edifice has a towering height of 130 feet and the temple complex consists of 27 independent marble petals assembled in groups of three, forming the nine sides and serving as entrances to the central space. 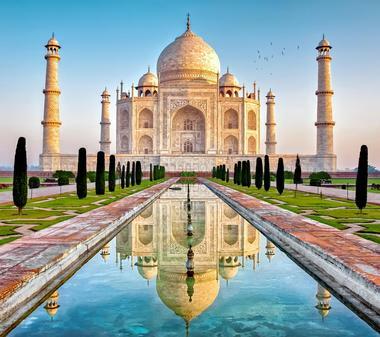 Probably the most notable tourist attraction in India, the spectacular Taj Mahal is also a UNESCO World Heritage Site. In 1632, Shah Jahan, the Mughal emperor, had this stunning white mausoleum made from marble and bejeweled with semi-precious stones for the burial place of Mumtaz Mahal, his empress and beloved wife. Today, it welcomes visitors to enjoy its splendor while unfolding the pages from the past. Beautiful picturesque descriptions reveal the history of this period and the facts about this architectural love story. Mumtaz’s tomb is the centerpiece of the 42-acre complex, which is set in magnificent formal gardens and features a guesthouse and a mosque. The Bali Life and Marine Park is the home of hundreds of extraordinary animals representing more than 100 different species including a few rare and endangered species such as the orangutan, the Komodo dragon, and the Bali mynah bird. 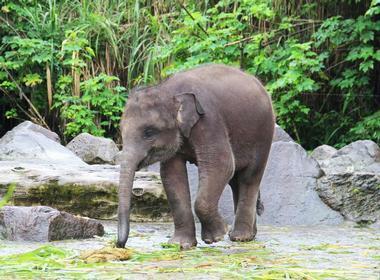 As Indonesia’s leading wildlife conservation center, they welcome visitors into their park to enjoy one-of-a-kind animal encounters and experiences. They offer private safari trips in either a 4x4 Jeep or on the backs of elephants, which include a wild fine dining experience surrounded by such animals as porcupines, lions, and meerkats at the Tsavo Lion Restaurant. The park also has a state-of-the-art theater, the Bali Theater, and the Water Park and Fun Zone. Tanjung Puting National Park is located on the southern coast of Borneo and features 1,600 square miles of swampy forest. Originally founded in 1971 by Birute Galdikas, it was known as Camp Leakey and served as a research and rehabilitation center for orangutans. 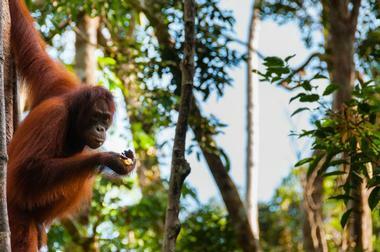 In 1982 it was declared a national park to continue protecting what Galdikas had started, the local orangutans and their surrounding environment. Visitors can only access the park via two-story live-aboard boats known as klotoks, which travel up the unique black water of the Sekonyer River. Along the way, visitors will enjoy viewing the various wildlife including orangutans, wild boar, proboscis monkeys, crocodiles, and macaques. 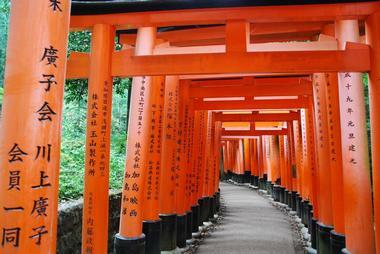 Inari shrines are an important aspect of Japanese culture. Fushimi Inari Taisha is the premier shrine of Japan, and the one with which the over 30,000 additional Inaris are connected. Constructed in 711 AD, people regularly gathered here and continue to do so to pray for the health and safety of their families, bountiful harvests, business prosperity, and other fulfillment-based wishes. Named an Important Cultural Property, it is one of the most iconic sites in the city of Kyoto. It features five connected shrines, the lower, middle, and upper shrines as well as two auxiliary shrines, Shino-Okami and Tanaka. They are considered the five pillars representing Inari virtues. Located in the Northern Japan Alps of Nagano Prefecture, Kamikochi is a well-known resort featuring some of the most awe-inspiring mountain scenery in Japan. 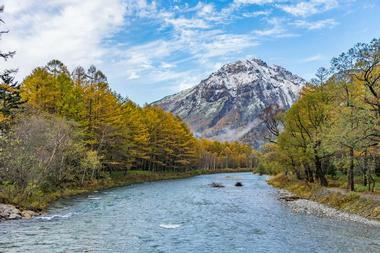 Nearly 5,000 feet above sea level, Kamikochi is an almost 10-mile-long plateau in the Azusa River Valley. It’s situated in a section of Chubu Sangaku National Park, surrounded by towering mountains including Maehotakadake, Nishihotakadake, and Okuhotakadake as well as the active volcano Yakedake. Since it resides within the national park, it has only been moderately developed with less than ten souvenir shops, mountain huts, hiking trails, and hotels. It is the ideal destination for outdoor enthusiasts, hikers, and naturalists. 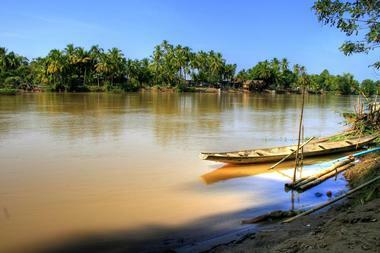 The 4000 Islands are a group of 4,000 small islands scattered along the Mekong. While the majority are wild and uninhabited, mainly due to their minuscule size, two of the southern islands, Don Khong and Don Dhet, are regularly visited. Both islands are located near the Cambodian border. Dong Khong, the larger of the two, is the most developed and the easiest to travel to. Its waters are known for being home to the illusive and rare Irrawaddy dolphin. Don Dhet offers a more laidback vibe with just a few bars and restaurants. Both islands are steeped in tradition and culture, featuring ancient buildings and various walking trails allowing visitors to discover a more rural side of Laos. 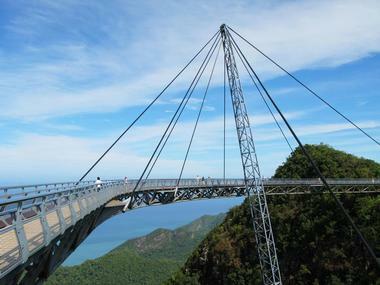 Constructed in 2005, the Langkawi Sky Bridge is an impressive engineering accomplishment towering above the verdant forests of the Gunung Mat Cincang Mountain. Winding around the peaks of a trio of lush mountains, this steel skybridge boasts a futuristic design suspended more than 2,000 feet above sea level. A pedestrian causeway, visitors can take a leisurely stroll along this over 400-foot-long skybridge and experience this natural oasis in a completely new and fascinating way. To access this attraction, visitors can rent a scooter, taxi, or car to the base of the bridge. Adventurous types can travel to the nearby Seven Wells waterfall and trek up to the summit of Gunung Mat Cincang. 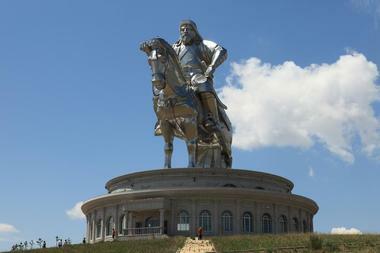 Genghis Khan is known as a savage and brutal ruler to most of the world, however to the Mongolian people he is admired as a national hero who established Mongolia as a cultural and political force. To honor him, the Genghis Khan Equestrian Statue was constructed in 2008, located 30 miles outside of the capital city, Ulaanbaatar. Standing at an incredible 130 feet in height and made of 250 tons of stainless steel, it is the largest equestrian statue in the world. At the foot of the statue there is an archeological museum featuring various portraits of Genghis Khan-related history and Mongolian costumes. A traditional restaurant is on their second floor. Anisakan Falls is a majestic and powerful waterfall plunging from a soaring height of 390 feet. 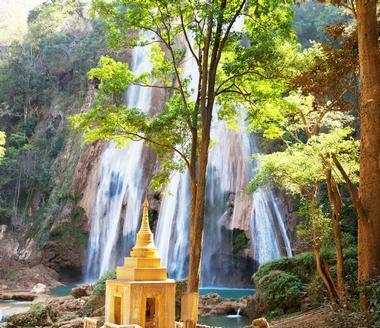 Located roughly 30 minutes outside of Pyin Oo Lwin, visitors will need to take a motorbike to a car park before making a 40-minute to hour-long rigorous trek to the base of the waterfall. At the end of the hike they will be rewarded with a beautiful sight as the thunderous water cascades down into a refreshing pool where they are more than welcome to take a dip. This calm oasis allows visitors to enjoy the relaxing sounds of nature while exploring the exotic surroundings. 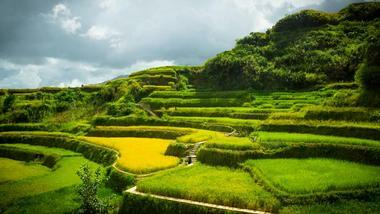 The Banaue Rice Terraces are among the Philippines National Cultural Treasures, located in the mountainous regions of northern Luzon Island and Ifugao. Constructed as a pragmatic solution to grow rice on lands that featured vertigo-inducing angles, these terraces soar to heights of nearly 5,000 feet above sea level. The remoteness of their location offers visitors awe-inspiring views of the terraced valleys. Many who visit chose to travel to a place known as Sunshine Point, an area where people from the local Igarot tribe sell wood carvings and pose for pictures. Guests can also choose to traverse the area on foot with a guide, where they can take cooling off breaks at various waterfalls and swimming holes. 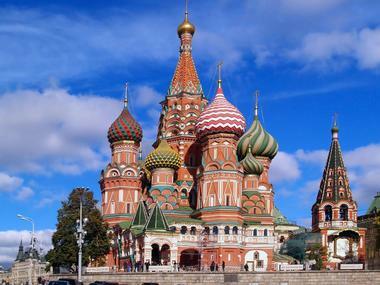 Saint Basil’s Cathedral is located at the southern end of Red Square. An icon of Russia, its construction was commissioned by Ivan the Terrible in 1552 after he captured the stronghold of Kazan. Its construction started in 1555 and was completed in 1561 by builders Postnik and Barma Yakovlev. Its design features an eclectic use of patterns, colors, and shapes, a style that is unique to Russian architecture, while the interior boasts nine main chapels, four octagonal-towered chapels, and four smaller chapels. A single chapel on the ground floor was added in 1588 for St. Vasily, a reported miracle maker and seer who Ivan himself both revered and feared. 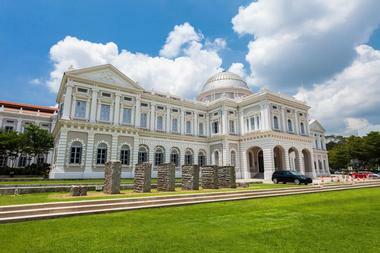 Originally opened as the Raffles Library Museum on Stamford Road, the National Museum of Singapore is the country’s oldest museum. 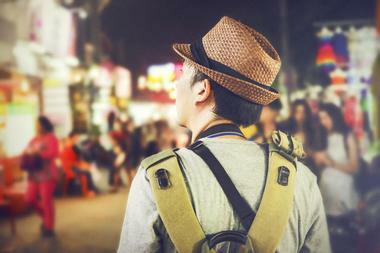 It is dedicated to inspiring visitors with its historical stories of Singapore and the world. While the museum is housed in an architecturally beautiful 19th century colonial building, its interior focuses on the progressive, utilizing cutting edge technology to introduce the nation’s development and legacy to visitors. This cultural landmark features a diverse variety of exhibitions, art installations, performances, film screenings, innovative act ivies, lively events, and a large resource center with over 15,000 publications pertaining to Singapore’s history, design, and cultural studies. 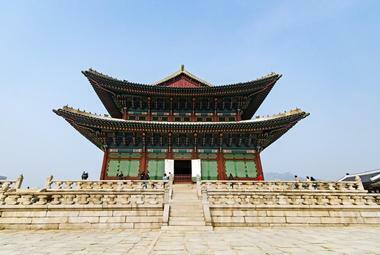 Constructed in 1395, Gyeongbokgung Palace was the first and largest of the five royal palaces, built in the center of Seoul, the capital of Korea. It represented the dominion of the Joseon Dynasty. Gyeongbokgung served as the main palace and was surrounded by the other four palaces, Deoksugung, Changgyeonggung, Changdeokgung, and Gyeonghuigung. All of these buildings were destroyed by fire due to the Imjin War, but were painstakingly restored between 1852 and 1919 under the guidance of Heungseon Daewongun while King Gojong reigned. Today, visitors can explore this grand palace, which also features two museums – the National Palace Museum of Korea and the National Folk Museum of Korea. 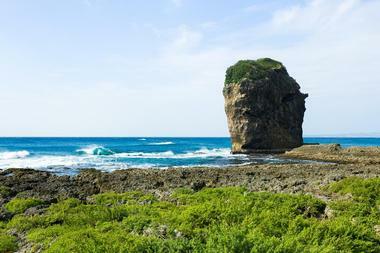 The Kenting National Park covers the entirety of Taiwan’s southern tip featuring rugged high cliffs, hilly terraces, low mountains, and sandy deserts. It’s an ideal destination for people who enjoy nature, outdoor recreational activities, cultural attractions, and a somewhat lively nightlife experience. Though it’s always been an iconic place, it has become increasingly more popular in recent years due to its appearance in hit movies such as Cape No. 7 and Life of Pi. Its beaches, boasting turquoise waters and yellow sand, draw swimmers, surfers, snorkelers, and scuba divers. The surrounding landscape provides incredible sightseeing, bicycle, and hiking opportunities. 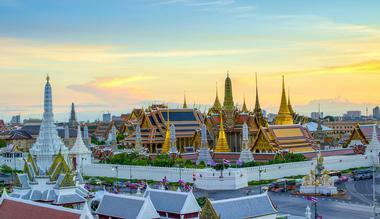 The Grand Palace is located in the center of Bangkok, Thailand. It originally served as the royal residence of the Rattanakosin Kingdom housing kings from five generations. Kings and other high-ranking members of the royal family were brought here before they were cremated. Today, the palace is used for receiving foreign dignitaries and state guests, as well as the King’s personal guests. Royal ceremonies are also held here. Visitors can tour the palace, which has two distinctive sections, the royal residence and Temple of the Emerald Buddha. The former is separated into three distinct areas – the Inner, Middle, and Outer Courts. 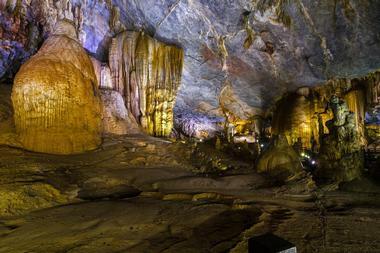 Phong Nha Cave was the first cave to be open to the public in the Phone Nha-Ke Bang National Park. To reach this cave, visitors will need to take a guided boat ride from the nearby town up the Son River. Along the way they’ll pass by the town dotted with vibrant churches, fishermen, and children splashing in the water. About 30 minutes later the boat reaches the end of the underground Chay River, which serves as the entrance to the cave. Once inside, the guides turn off their motors and paddle you into a mysterious, slightly eerie, but absolutely magnificent underground world. Low ceilings, narrow passageways, caverns dripping with stalactites, and crystalized figures create this intensely moving ambiance. 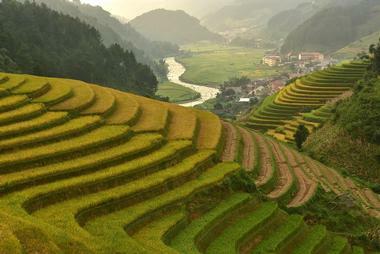 Located in Sa Pa, Vietnam, the Sa Pa Terraces, which are terraced rice fields, are a famous attraction. Not only are they the biggest supplier of rice in the province, but they also welcome visitors to explore the area. The fields are in a mountainous area stretching toward Hoang Lien National Park. While more experienced travelers may want to explore on their own, hiring a guide or joining a trekking tour group is recommended, as you’ll see the most beautiful sights and find the most picturesque views of the terraces. Many of these tour companies will even organize a place for visitors to stay overnight to really immerse themselves in the culture.